FAYETTEVILLE, Ark. 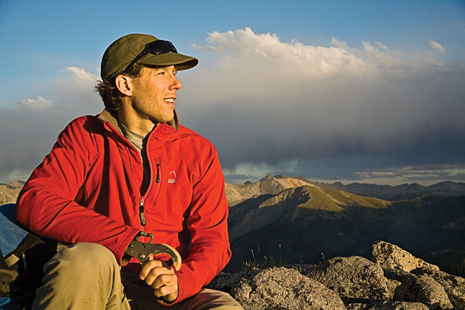 – Aron Ralston, the mountain climber who amputated his own arm to save his life after a climbing accident, will speak at 7 p.m. Monday, Nov. 28 at the Fayetteville Town Center. Ralston will appear as part of the University of Arkansas student-sponsored Distinguished Lecture Series. The event is free, open to the public and no tickets are required. Ralston has a degree in mechanical engineering from the Carnegie Mellon Institute, but he left that career behind in 2002 to pursue his passion for mountain climbing. On a solo excursion into Blue John Canyon in Utah in April, 2003 he was trapped by an 800 pound boulder that dislodged and crushed his right arm, pinning him against the canyon wall. He had told no one where he was going, had no means to communicate, and no hope of being rescued. On the sixth day of his ordeal he used the two-inch knife blade of a multi-use tool to cut off the lower part of his right arm. He then rappelled out of the canyon and started hiking across the desert. A vacationing family spotted him and managed to contact a rescue helicopter. Ralston’s ordeal made national headlines, earning him ongoing coverage in national television, newspapers, magazines and online media. He wrote a book about his experience, Between a Rock and a Hard Place, published in 2004. The 2010 film, 127 Hours, retold his story, with James Franco starring as Ralston. The film received several Oscar nominations, including Best Picture. Ralston continues to climb mountains. Before his accident he had set out to climb all 53 of Colorado’s “fourteeners” – mountains over 14,000 feet high. His goal was to be the first person to do this solo, and in the winter. In 2005 he achieved this goal. He has climbed several other well-known peaks, and has said he intends to climb Mt. Everest in the future. The Distinguished Lecture Series at the University of Arkansas is a student-sponsored program. Speakers are chosen by a student committee, and the events are funded by a student-approved fee, appropriated by the Associated Student Government.